With Vivid Sydney just around the corner, Captain Cook Cruises has released its program of Captain Cook Vivid Cruises. Easily one of the best ways to experience the festival, these cruises sail through all Sydney Harbour Vivid precincts and offer another perspective on the spectacular light shows. There are a range of cruise options available, with options that are well-suited to families as well as later in the evening fine-dining options. The nightly one-hour Vivids Light cruise, departing from Barangaroo, King Street Wharf No. 1, is ideal for families and anyone who wants to avoid the pedestrian crowds of the festival. There are up to seven departures nightly, which include additional services at peak periods. Captain Cook Cruises is also offering a range of dinner and drinks cruise packages. These start from the 5pm sunset cruise, which includes a 1.5 journey through Sydney Harbour, three-course set menu and open bar of wine, beer and soft drinks. The 7:30 Captains Dinner offers 3.5 hour cruise around the harbour, three-course contemporary Australian a la carte menu and live music and entertainment onboard. For those who want an extra special Vivid experience, opt for the 7:30 Gold Penfolds Dinner & Drinks cruise. With a 3.5 hour journey around the harbour, five-course degustation dinner and accompanying Penfolds wine with each course, spirits and beer package as well as lounge entertainment, passengers aboard this cruise are in for a truly memorable experience. 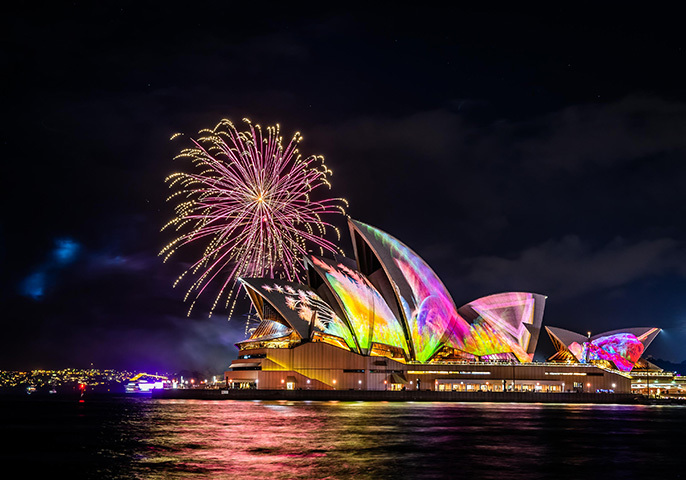 Vivid Sydney runs from 24 May to 15 June 2019.